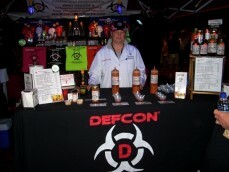 This was my first hot sauce event and I felt like a kid at Christmas. The first word that comes to mind is WOW. I was just in wonderment of it all. There were a lot of nice people and good hot sauces, too many to remember. I apologize to everyone I missed. 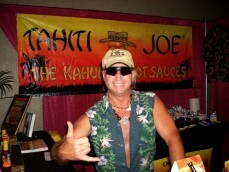 My first taste of fire came in the form of a bloody mary at Tahiti Joe’s booth where I was greeted with a hearty aloha! 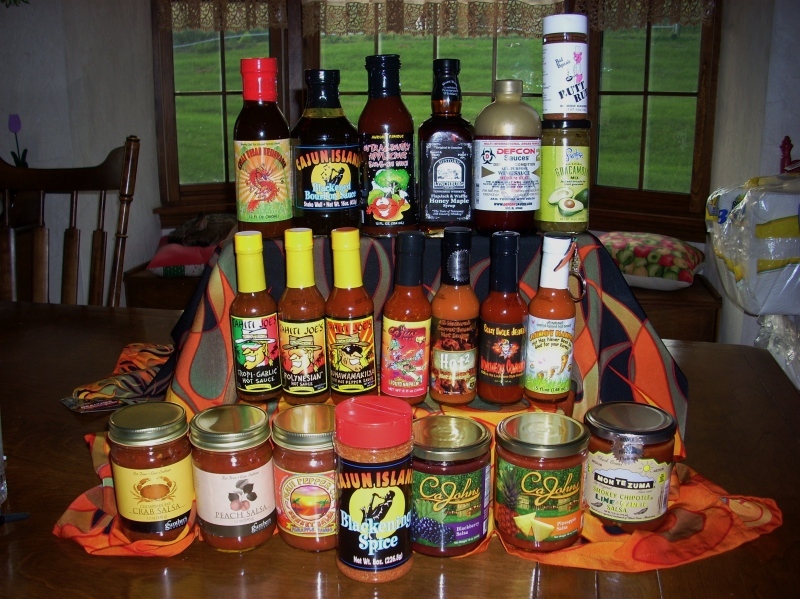 It was made with his Polynesian hot sauce, which is just one of his many tasty sauces. It was just spicy enough to wake me up without frying my taste buds. Tahiti Joe’s hot sauce was one of my favorites. I really enjoyed the tropi-garlic hot sauce. Chock full of flavor with a nice heat. CaJohn‘s was there with a bounty of hot offerings. Too many to name or remember. One of the sauces that stuck out was the lime chipotle. It had a great flavor without blistering your mouth. My wife really liked the blackberry salsa and the pineapple salsa. Both are yummy with a fruity zip. We stopped by the Miller’s mustard booth to try there new mustard. It’s a milder version, and in my opinion a tastier one. It’s a nice sweet heat. We meandered past the ice cream booth and the Italian ice. They would come later. 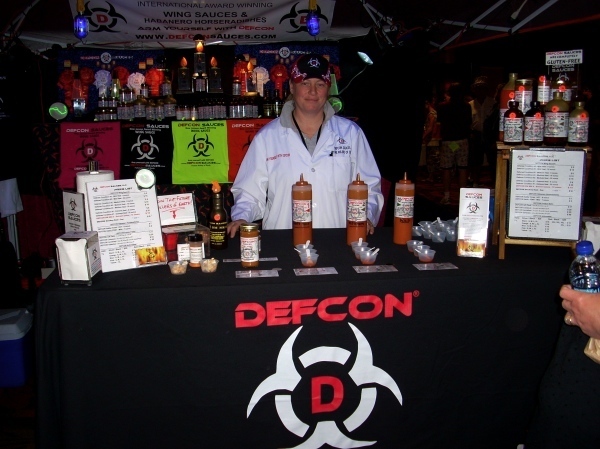 We headed over to the Defcon sauces booth. I was greeted by a woman in a lab coat . To the left of her was The Pain Center. An eye catching display to say the least. I sampled two of their concoctions. The Defense condition #2 and the Defense Condition #1. They are both very flavorful. The #1 was the hottest. The next stop on the way to heatville was Crazy Uncle Jester’s Inferno World. He had his whole line up there. The ice cream booth even had his Afterburner sauce available. It’s a yummy chocolate sauce spiked with habaneros. He was very nice and entertaining. He even autographed a bottle for me. As our journey continued we headed to Walt’s. We had some pulled pork with some of his tasty BBQ sauce. His BBQ rub was really nice. A true rub, with more sugar than salt. You definitely need to get some of his rub. Our journey led us to the bayou by way of VA. Cajun Heat’s Liquid Napalm. The name says it. A super tasty sauce with heat to match. ( two bottles here.) Porky’s Gourmet had a buffet of goodies. Everything from pancake syrup to hot sauce. All of their products were yummy too. Gunther’s Gourmet was next. He had an array of award winning salsas. The peach salsa was surprisingly good. It was a nice balance of fruit and salsa. The most interesting salsa was his crab salsa. I had never heard of mixing crab in salsa. I have two words for you. Get some. Our progress was slowed by a human traffic jam. As we were “rubber necking” the obstruction came into view. 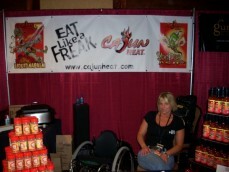 It was the Cajun Island booth. They were handing out samples of grilled chicken and wings coated in their blackened bourbon sauce. Mmm….They also had their blackening spice there. Two great products. The sauce is thick, sweet and dark. The blackening season is a winner too. If you like “cajun seasoning” you”l love this stuff! Flaming Joe’s was our next stop. His Caribbean style jerk sauce was T-A-S-T-Y. This is a party in the making. 1 part Flaming Joe’s Caribbean style jerk sauce, 2 parts chicken(bone in of course), 3 parts Red Stripe, and 4parts friends. Mix until joyous. Our trip continued to the Confetti Pepper’s booth. I’m glad I stopped. It’s ribbons of delicious pickled hot peppers. They are fantastic! I regret getting just one jar. They are a perfect topper for hot dogs, bratwurst, etc. Our day finished up at the Intensity Academy booth. The best teyiyaki marinade that I have tasted! Stir-fry here I come! Or maybe kabobs, or maybe…..sorry. They have a variety of carrot based hot sauce too. In the words of Rachael Ray, YUMMO! Now somewhere in amidst all of this fun something happened. Call it machismo, call it curiosity, or call it plain stupid. I noticed a bottle of Dave’s Insanity Ghost Pepper hot sauce. It looked innocent enough. I dipped a pretzel stick half way in the bowl. Then a gave it swirl to make sure I had enough on there to get a good taste. OUCH!! I’m pretty sure my head had swollen to twice it’s size. As I wiped my eyes I wondered if biting a briar bush would have been the smarter thing to do. About 20 minutes later, when the inferno in my mouth dulled to a bonfire, I told my friend about this sauce he just had to try. The Weekend of Fire is definitely going on my calendar for next year. I can’t wait! 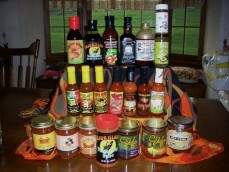 Shawn came home with about 20+ bottles of sauces, rubs, and other goodies. Here’s his pic of the “haul” from the show. 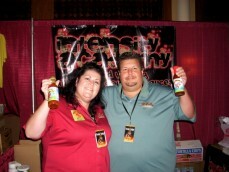 Thank you Shawn for a first-person report of your first hot sauce food show. 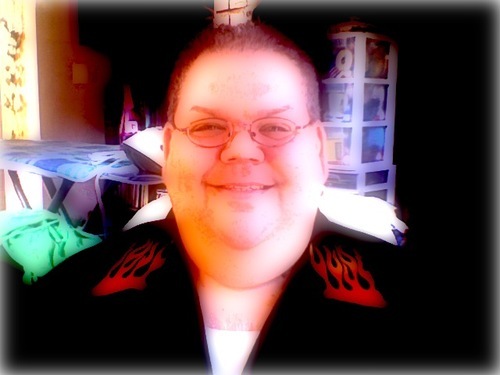 I figure a guy with flames on his shoulders knows what he’s doing, so I hope to make it there next year to meet you in person and all the other crazy chileheads! Great Show! We had a great time, can’t wait till next year. Thanks for the comment.